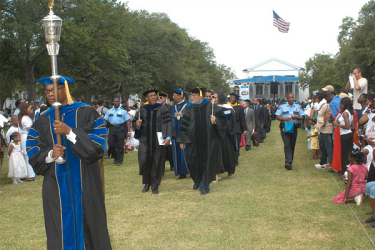 Dillard University is a private, Historically Black liberal arts college located in New Orleans, Louisiana. It is affiliated with the United Church of Christ and the United Methodist Church. Dillard University is a result of the merger between Straight College and New Orleans University in 1930. The origins of the university, however, date back to 1869. Responding to the need to educate the freedpeople in New Orleans, the American Missionary Association (AMA) of the Congregational Church founded Straight University. The Freedman’s Aid Society founded Union Normal School, which was later renamed New Orleans University. Straight University was renamed Straight College in 1915 and ran a law department from 1874 to 1886. New Orleans University operated a secondary school called the Gilbert Academy. In 1889, New Orleans University opened a medical department named Flint Medical College that included a pharmacy and a school of nursing. The medical college was discontinued in 1911, but the hospital and nursing school were continued under the name of the Flint Goodrich Hospital. During the late 1920s, local black and white leaders began to discuss the need for a larger, more comprehensive institution of higher learning for African Americans in New Orleans which at the time had one of the largest black populations in the nation. In 1930, New Orleans University and Straight College merged to form Dillard University, named after James Hardy Dillard, a distinguished white educator who dedicated his life to serving African Americans. The trustees of the newly formed institution called for the implementation of a coeducational, interracial school, serving predominantly African American students, adhering to Christian principles and values, and offering a traditional liberal arts curriculum. The opening of the university was delayed nearly five years over disputes involving the leadership of the campus. Many black leaders wanted Dillard to be headed by a prominent African American educator but concerns were raised over how white faculty would respond to having a black president. In 1935, the school opened with Will W. Alexander, a prominent white southern preacher and former director of the Commission on Interracial Cooperation as its first president. Despite the dispute over campus leadership, Dillard attracted prominent African American scholars such as Horace Mann Bond in education, Lawrence Reddick in history, and St. Clair Drake in sociology. Dillard University grew over the next half century. Its nursing program (accredited in 1942) was the first nursing program to become accredited in the State of Louisiana. In 2002 Dillard created the Institute of Jazz Culture (IOJC) to study the origins of and continuing role of jazz in New Orleans. Dillard University was impacted by Hurricane Katrina in August of 2005, which forced the campus to be temporarily relocated. The campus was re-opened in the Fall of 2006 and continues to rebuild in the aftermath of the Hurricane. Today, Dillard University enrolls approximately 900 students which is half of the student body prior to Hurricane Katrina. It offers 34 majors in six academic divisions leading to a Bachelor of Arts or Science degree. Dillard’s graduates include Dr. Ruth Simmons, the first African American President of an Ivy League institution (Brown University), Ellis Marsalis, Jr., jazz pianist and music educator, and Garrett Morris, comedian. Louise Bernard and Radiclani Clytus, Within These Walls: A Short History of Dillard University (New Orleans: Dillard University Office of the President, 2000); Dillard Heritage, http://www.dillard.edu/index.php?option=com_content&view=article&id=55&Itemid=63 (Official site).